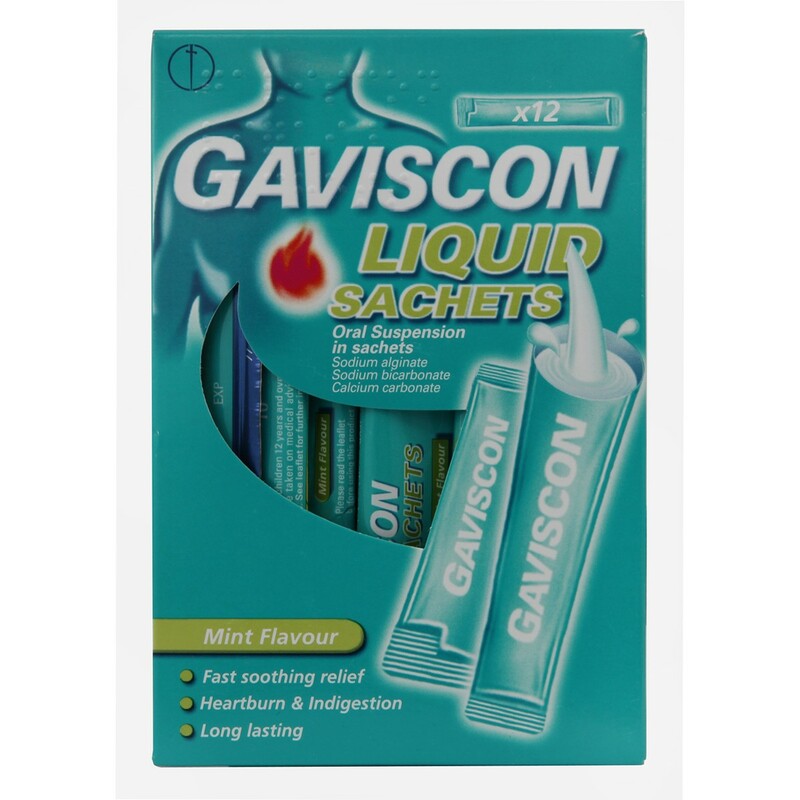 Gaviscon Liquid Sachets Mint flavoured bring fast, soothing and long lasting relief from the pain and discomfort of heartburn and acid indigestion. Gaviscon Liquid Sachets contain the tried and trusted Gaviscon Original Peppermint Liquid formulation now available in convenient individual sachets. The sachets are ideal for when you are on the go - whether on a flight, in the car, out shopping or in a restaurant. Gaviscon soothes irritation in the esophagus (food pipe) on its way down to the stomach. But once it has arrived in the stomach the action really begins! It works by forming a raft (thick layer) on top of the stomach contents soon after it makes contact with the stomach acid. The raft acts as a strong physical barrier and helps keep all the components of the stomach contents in the stomach where they work, not letting them seep back up into the esophagus where they hurt. For oral use.Adults,including the elderly and children 12 years and over: One to two 10 ml sachets after meals and at bedtime or as directed. (up to four times a day)Children under 12 years : Should only be taken on medical advice.If symptoms persist after 7 days consult your doctor.Contains sodium and calcium.If you have been advised to follow a diet restricted in either of these salts,please consult your doctor before taking this product. Thank you for your interest in Gaviscon Liquid Sachets. Enter your email and we'll contact you as soon as it's available again.